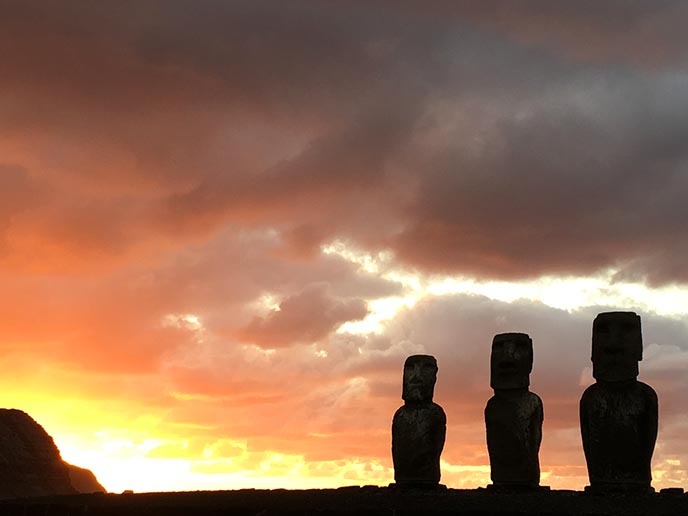 Easter Island sunrise at Ahu Tongariki! 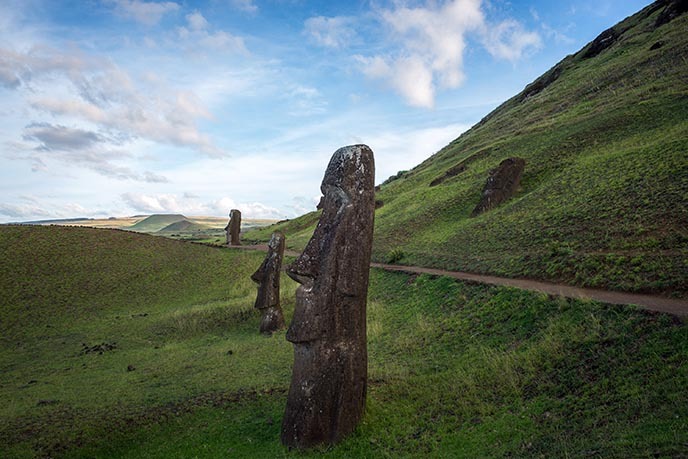 Moai statues, stone heads, Rano Raraku quarry tours. 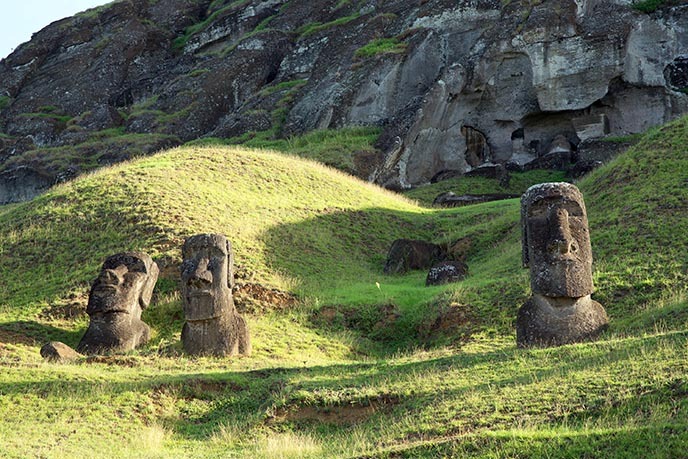 Easter Island is one of the strangest places on Planet Earth. With stone-faced statues and weird landscapes, it’s no surprise that some truly believe UFOs landed here! 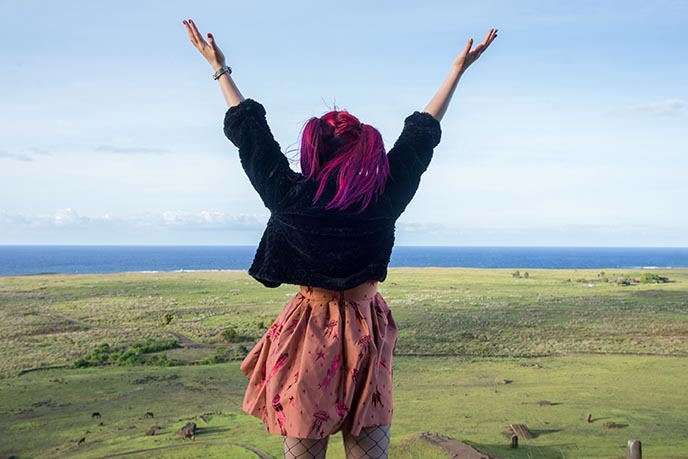 Visiting “Isla de Pascua” was one of my long-time travel goals. This year, I finally made it to the land of the moai. As you’ll see in this story, it surpassed my high expectations. 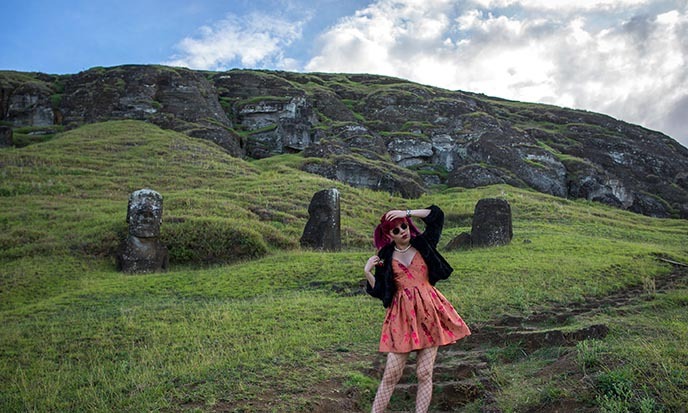 In part one of my moai adventures, I visited the northern part of the island, where I saw Orongo and other famous sites. Isn’t this as close as it gets to a real life Mario-Land? 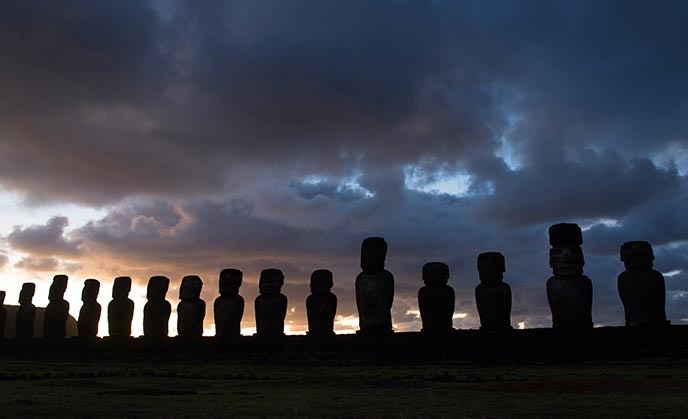 Read on for tales of the mystifying moai of Easter Island! 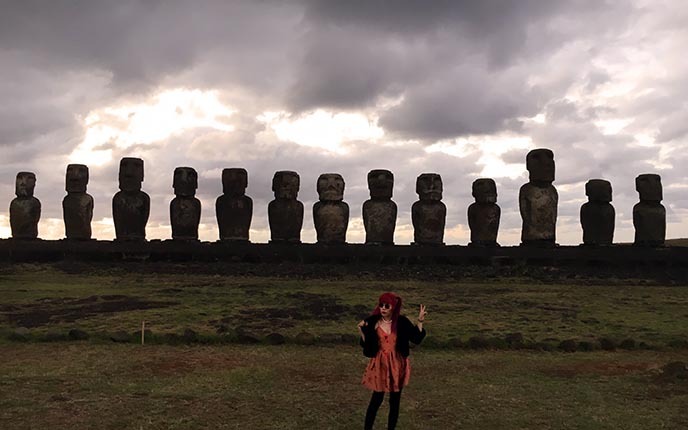 I still can’t believe I got to see Easter Island… it feels like a lucid dream. 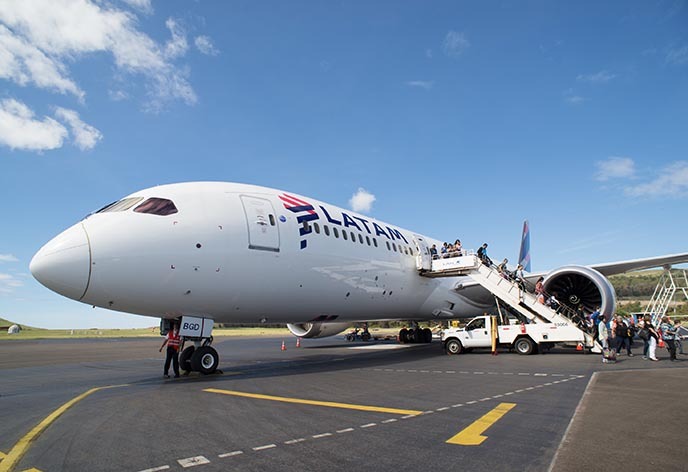 LATAM Airlines, the only airline that flies here, made this extraordinary trip possible. On the second day of my journey, I woke up at 5 am to catch the famous sunrise at Tongariki. The lovely Patricia of Easter Island Travel picked us up from our hotel Hangaroa, and we drove east for about 45 minutes. When I stepped out of the car, I was in awe at the sight before me. A crescent moon glowed above the silhouette of 15 giants standing in a row — it was a vision straight out of a sci-fi movie! As the sun began to light up the sky, I felt like I was in front of a fleet of extraterrestrials. I can only imagine what it was like for the Dutch explorers to arrive on Easter Island in 1722, and encounter this mind-bending sight. Space invader, that’s me. The landscape of Easter Island made me think of Mars. 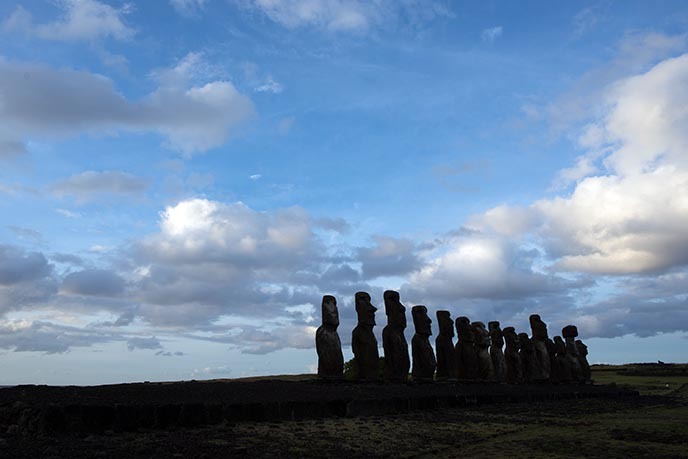 With fifteen statues in line, Tongariki is the largest “ahu” (platform) on the island. 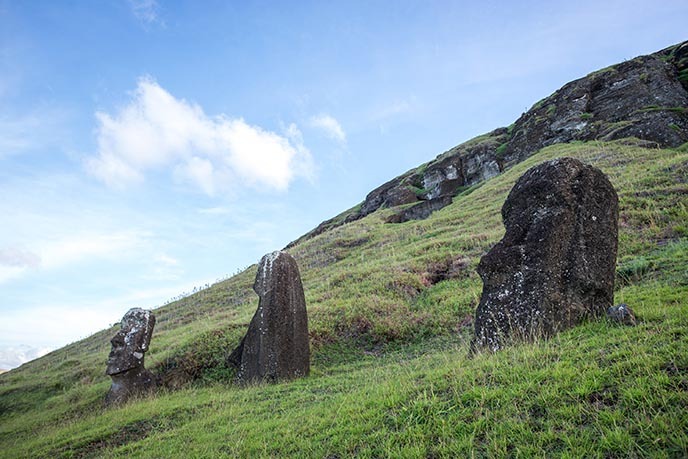 During the island’s civil wars around the 1700s, these Godzilla-sized moai were toppled. In 1960, the ahu was also swept inland by a 9.5 earthquake (one of the largest ever recorded) and tsunami. Tongariki has since been restored, as you can see from the powerful shapes of the 15 stone men today. 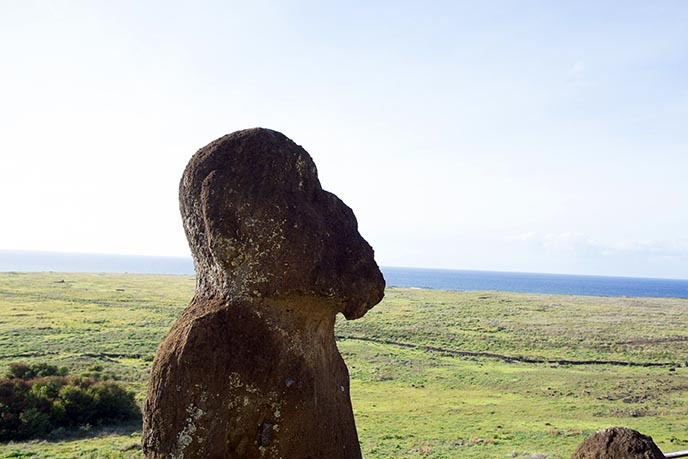 Ahu Tongariki has some of the largest and most exquisite moai on the island. 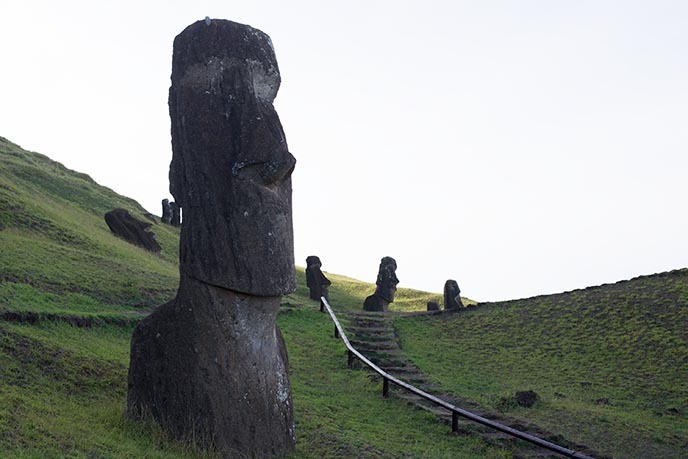 The largest of the bunch weighs 86 tonnes; it’s the heaviest statue ever erected by the Rapa Nui. 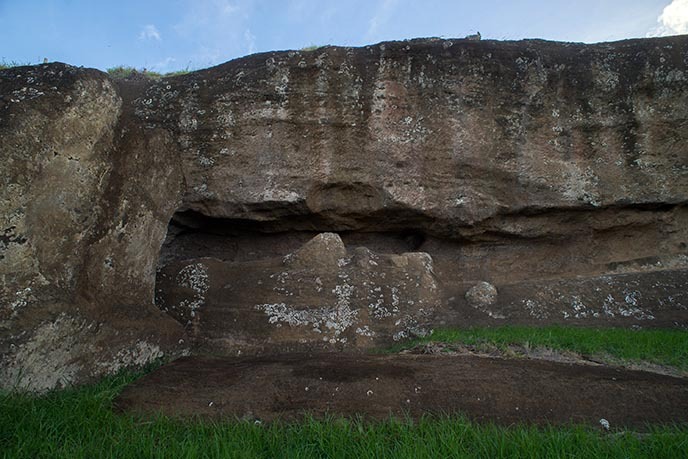 As you can see, only one of the moai at Tongariki still has his “pukao” (red hat or topknot). Some of the others originally had pukao as well, but their headwear was too badly damaged to be restored. 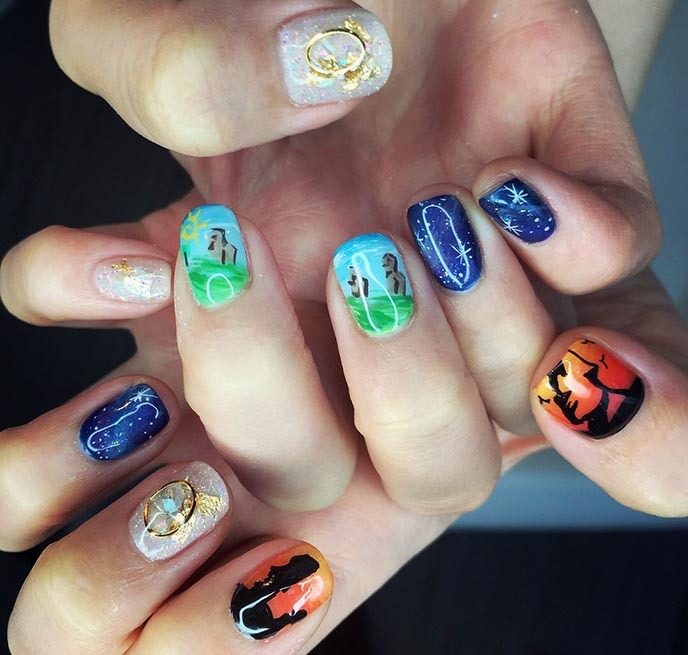 My nail art, by Keiko Matsui at Vancouver BC’s Glam Nail Studio, sums up the magic of Easter Island. She drew the stone faces and their silhouettes at dawn, as well as dark skies filled with stars. As the sun rose, the sky burst into radiant hues of red and orange. Slowly, the rays illuminated the details of the carvings. 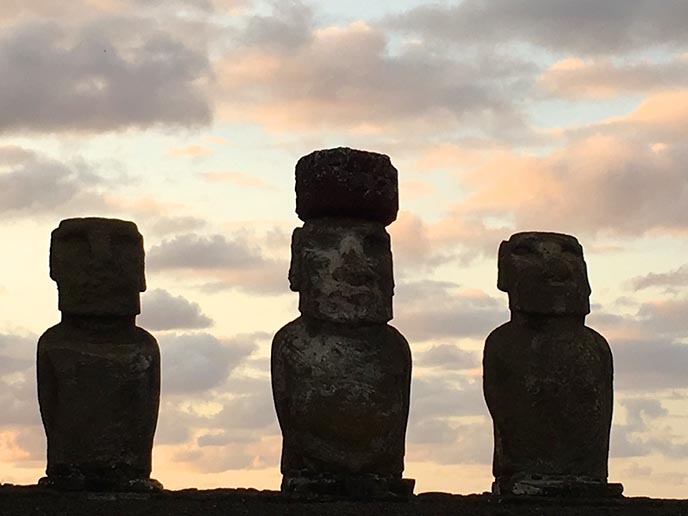 The moai are all unique in small ways, which gives each of them personality. Scholars believe they are homages to ancestors, and infused with “mana” or energy. No matter what you believe, these 15 elders undoubtedly radiated a feeling of power. Alien nation. 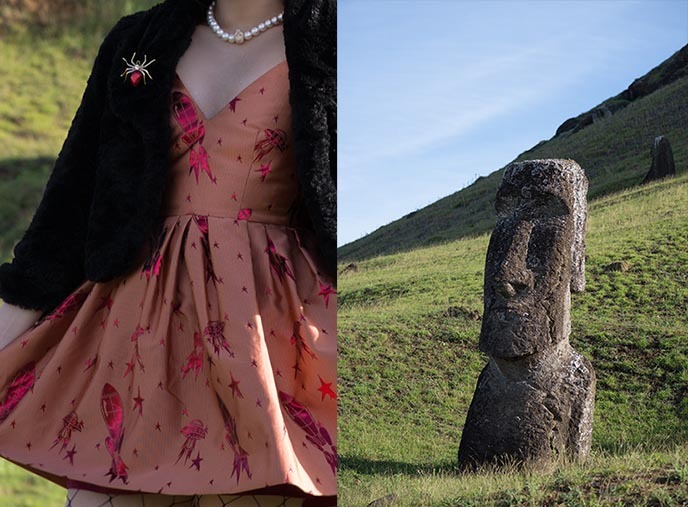 (Although Easter Island has a hot tropical climate, it is a bit chilly in the early morning, so I recommend that you wear layers). I’m wearing metal round sunglasses by Edwardson Eyewear, and a spider brooch on my faux fur black jacket. It’s easy to fantasize about aliens building these statues. However, the truth is that early humans were capable of remarkable feats of art and engineering. 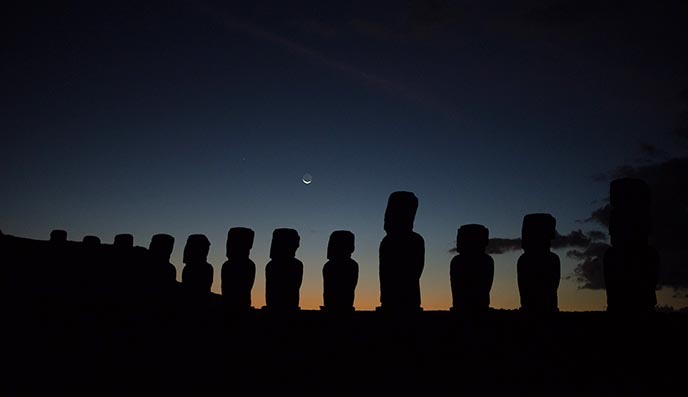 Easter Island’s inhabitants knew a lot about astronomy as well. This 100-meter long platform faces sunset during the summer solstice. On the other side of the ahu is Poike volcano, the oldest on the island. Legend tells of a battle between “the long ears” and “the short ears” taking place here. These days, it feels like tourists are everywhere. 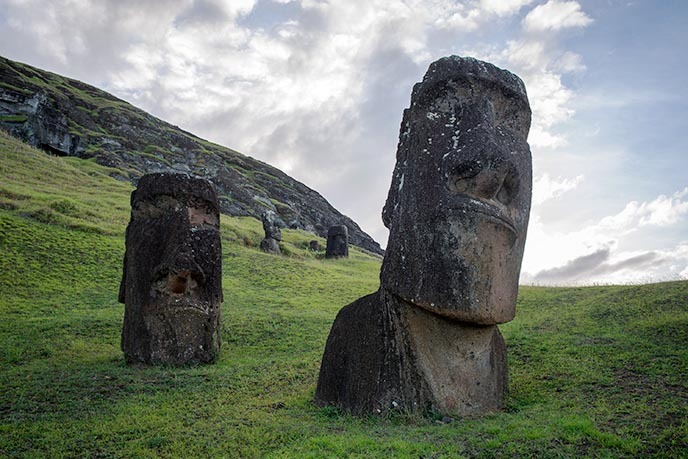 In remote Easter Island, however, there are very few visitors. What a joy to experience Tongariki with only about 50 other people. There was plenty of room for everyone to stand or sit (or hail the moai), and no gift stores or vendors. When I saw this moai on thet way out, Covenant’s song lyrics came to my mind. In the 1990s, the Japanese contributed immensely to the restoration of Tongariki. As a thank you, the people of the island sent this moai to Japan to be exhibited. 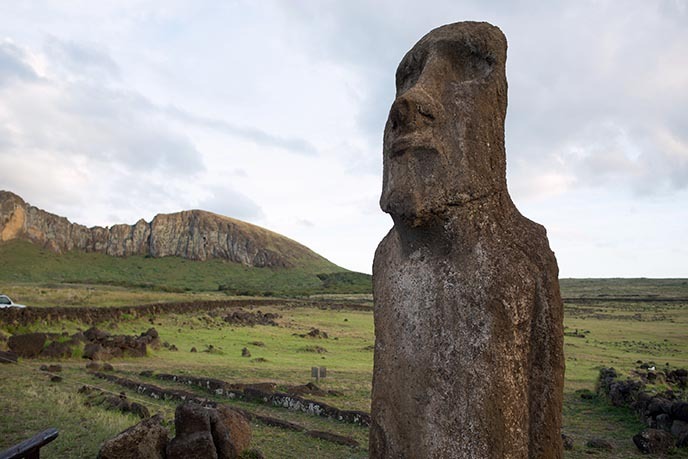 This moai was also used in the ‘walking’ experiments of Thor Heyerdahl, which researched how the inhabitants originally moved the stone figures. It’s believed that they held them upright with ropes, and shuffled them back and forth until they reached their final destinations. 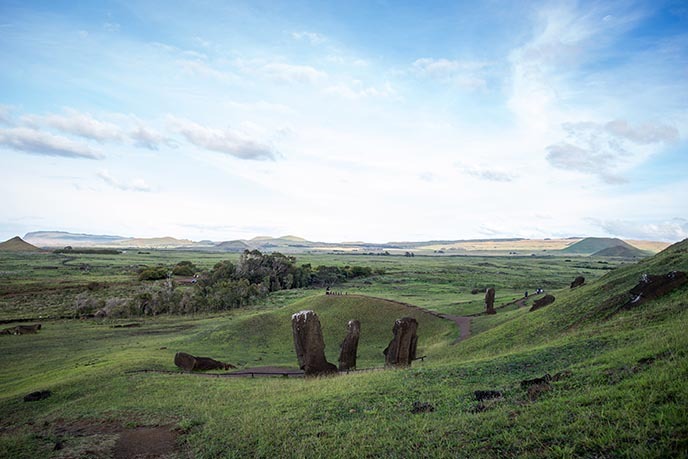 The feeling of being a “stranger in a strange land” continued at the nearby Rano Raraku. This is the stone quarry where most of the moai were carved. With monolithic heads sticking out of rolling green hills, I felt like I was inside a Super Mario video game. 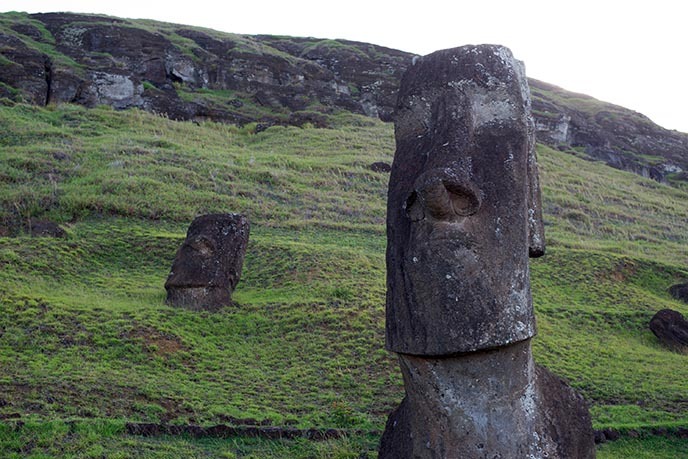 Archaeologists are still making startling discoveries about the moai. Not long ago, they excavated a few of these giants… and found out that they have bodies beneath the ground! Over the years, the statues were naturally covered with eroded dirt, which left only their faces poking out from the grass. 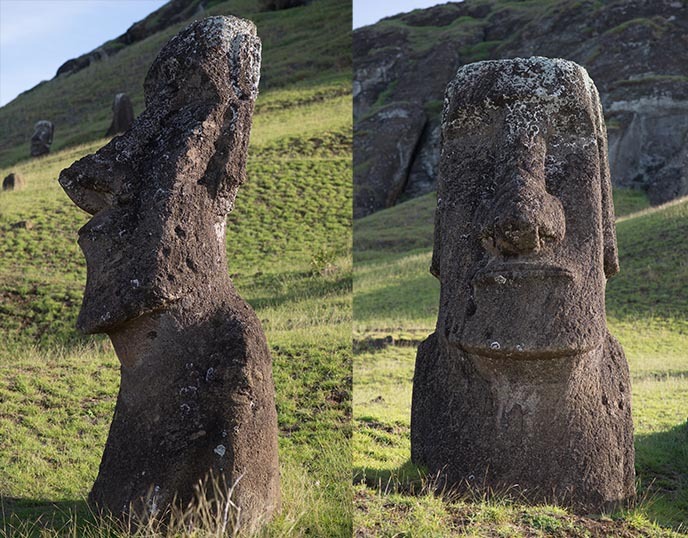 Some of the moai were half-carved or abandoned, which makes it look as if they are “sleeping” face-down. My imagination flowed as I walked around Rano Raraku. I pictured the creatures “waking up” one day, and teaching us their secrets. 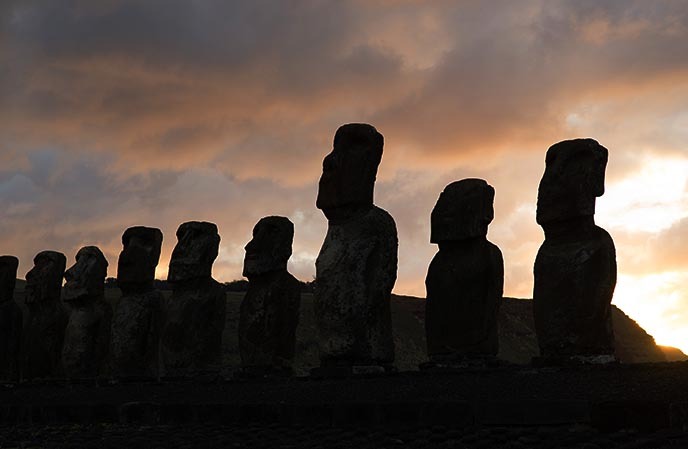 To this day, there remain so many unanswered questions about the moai. 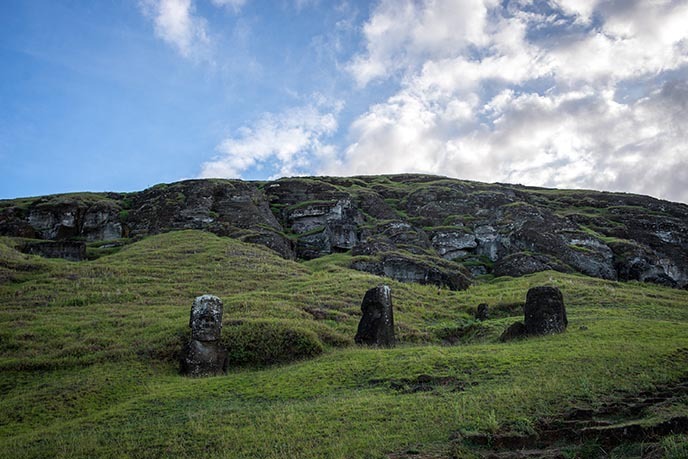 It’s extraordinary that the ancient tribes of Easter Island were able to engineer these monoliths, which have become recognizable worldwide (they even have their own emoji ). 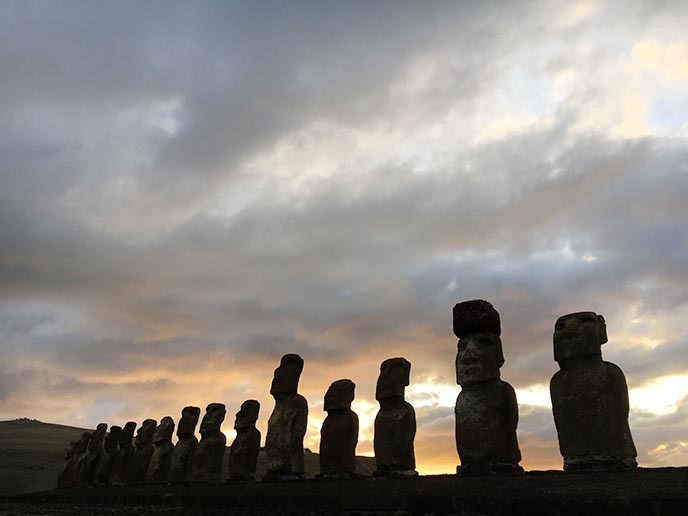 As I mentioned before, you must purchase the National Park Ticket (at airport arrivals) in order to see the most famous moai, and some sites are limited to one entry only. 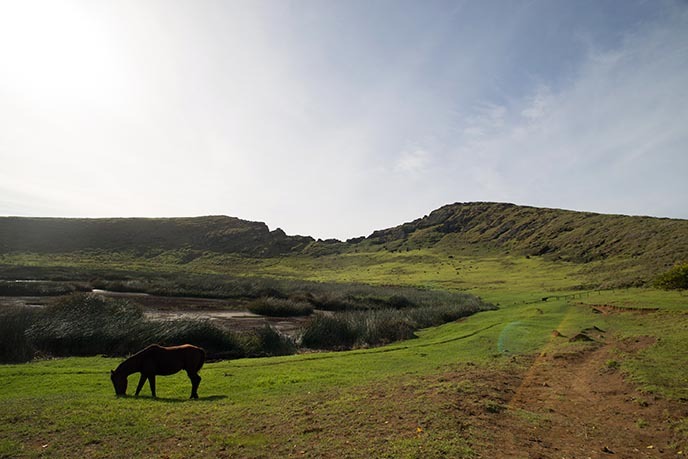 Visitors must stay on the paths at Rano Raraku. We saw a tourist wander off-limits towards the moai… and yelled “yo!” until a guard came horseback to tell him off! 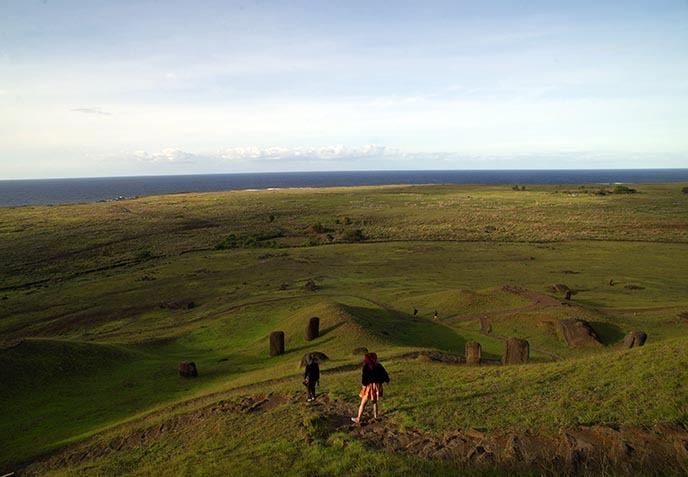 Rano Raraku is a UNESCO World Heritage Site, and these hills give a spectacular view of the surrounding ocean. 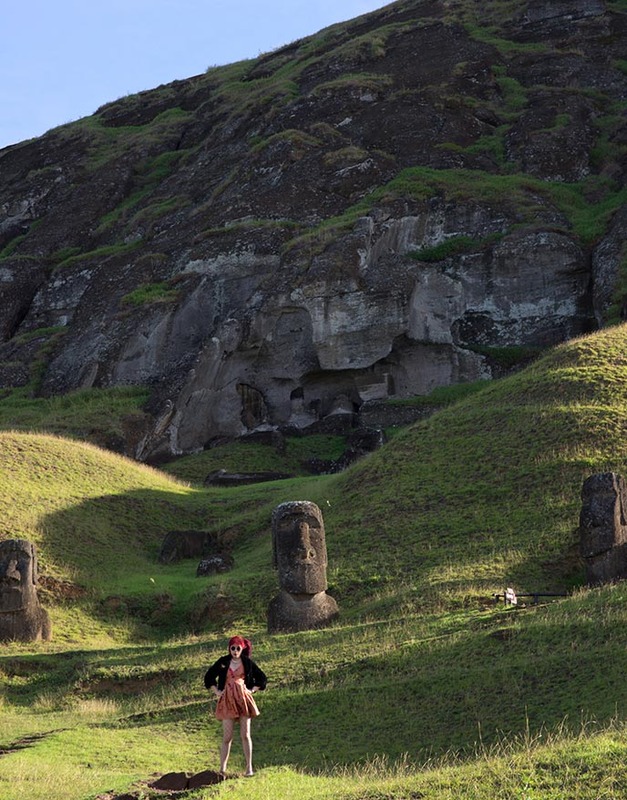 There are about 400 moai resting here… I gave them a hearty Hail. 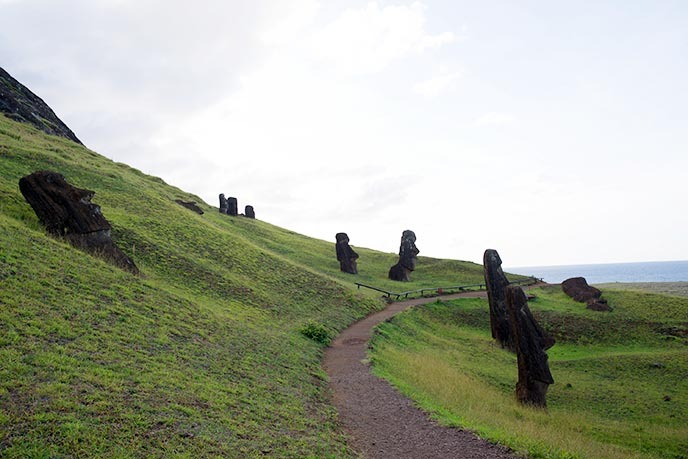 All of Easter Island’s moai were originally carved in this quarry, before being transported to various locations. 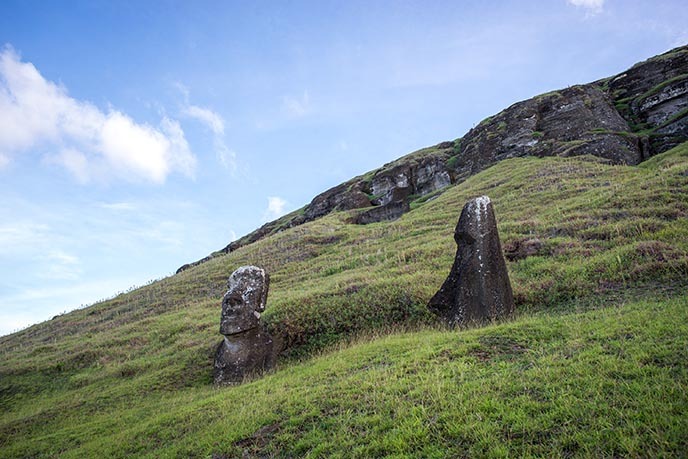 Many of the moai were half-carved and abandoned, or never moved — so they remain grounded at Rano Raraku. Here’s a big guy, in the process of emerging from stone. His profile is easy to recognize… but the artist stopped working on him for unknown reasons. Our sweet guide, Patricia, pointed out “sleeping moai” along the roads. They fell or broke while being transported, and were abandoned as their “mana” was considered to be lost. 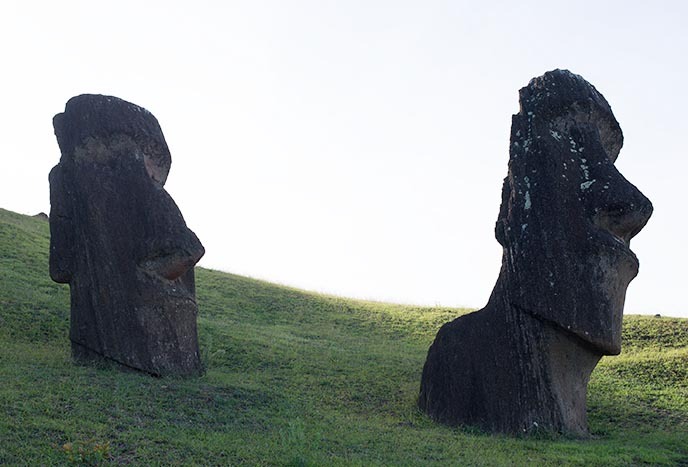 It looks like these face-down moai are taking a nap… one day, maybe they will wake up! 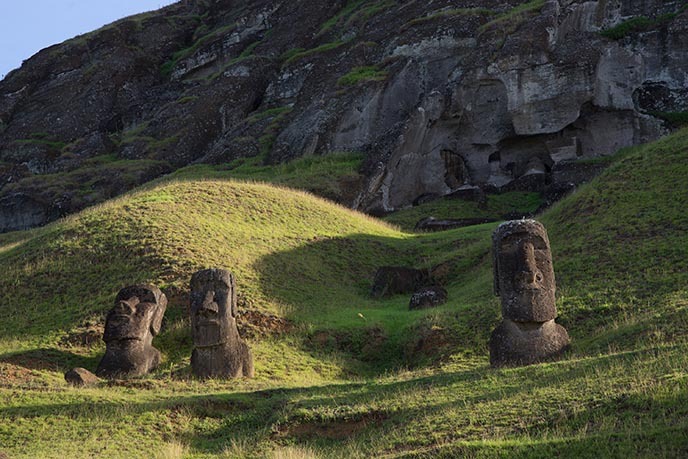 With their sloped noses, pursed lips and unreadable expressions, the moai look like “chill dudes” hanging out. No wonder their replicas are often found in tiki bars. 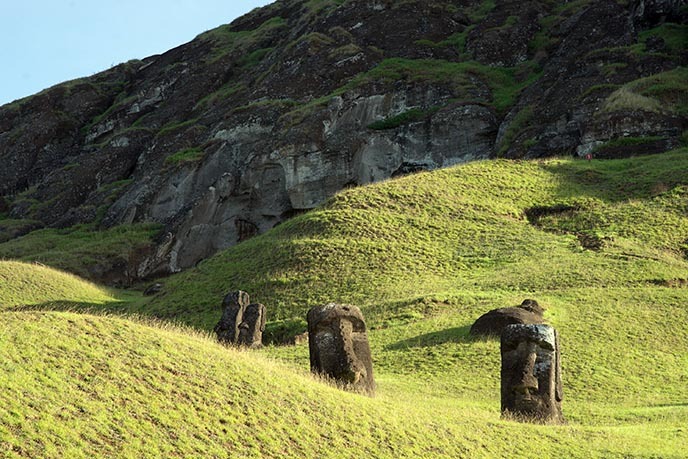 Rano Raraku is only about a five minute drive from Tongariki, so it makes sense to visit both at the same time. I recommend first seeing the sunset at Tongariki, then heading over to the quarry. Having a private driver/guide and car meant that we could be flexible, and spend as much time as we needed to take photos. 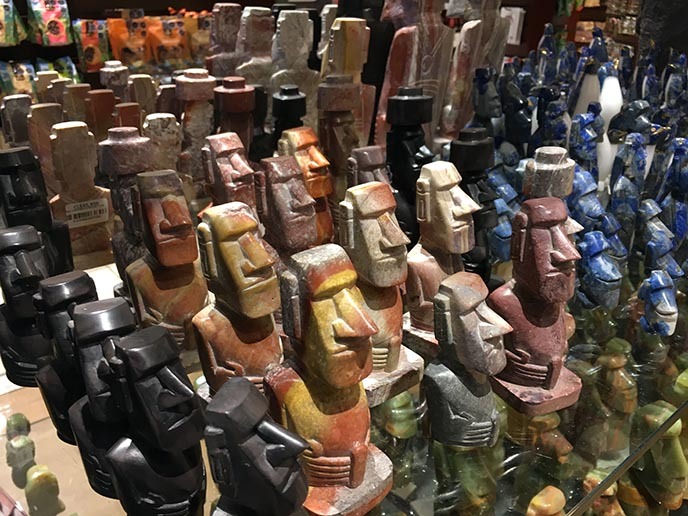 One of these moai is not like the others… Introducing “Tukuturi.” He’s carved in a different style, out of red scoria from Punu Pao. Tukutiri has a beard and unique facial features, and sits in a kneeling posture. 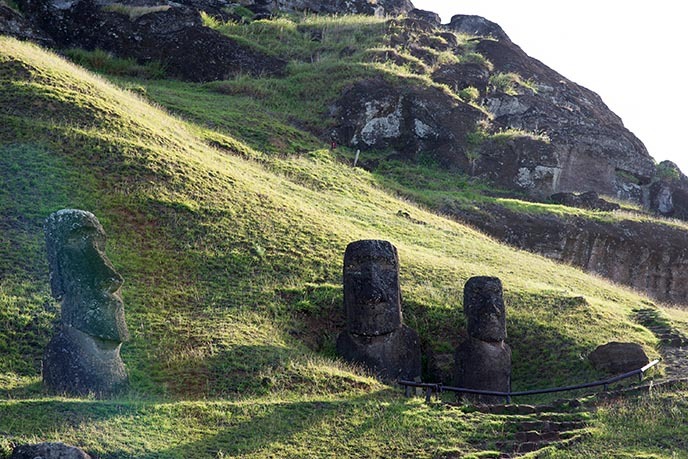 The visible moai are already huge… but remember, they have bodies beneath the ground. This makes them up to three times larger! Rano Raraku is a a volcanic crater. You can take another path to see the dramatic asteroid-like indentation. I always had a fascination with the stone-faces, and am grateful I had the chance to meet them. Close-up on the carvings. Minimalist, monolithic mastery. This puzzling civilization fired up my imagination. 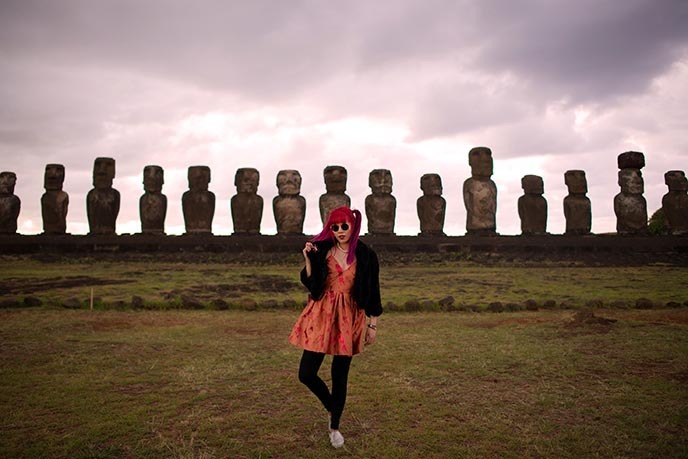 Easter Island is without doubt one of the coolest places I’ve ever been. Details of my rockets and stars dress by House of Holland (see their space collection here). My pearl and skull necklace is Alex Streeter. Now that I had seen all the major attractions on the isle, it was time to go. We said goodbye to the horses grazing around the crater. 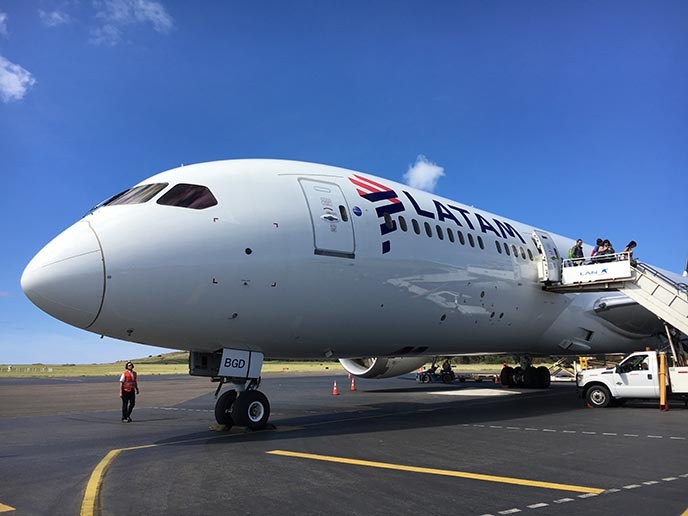 LATAM Airlines is a rock star for making our journey possible. 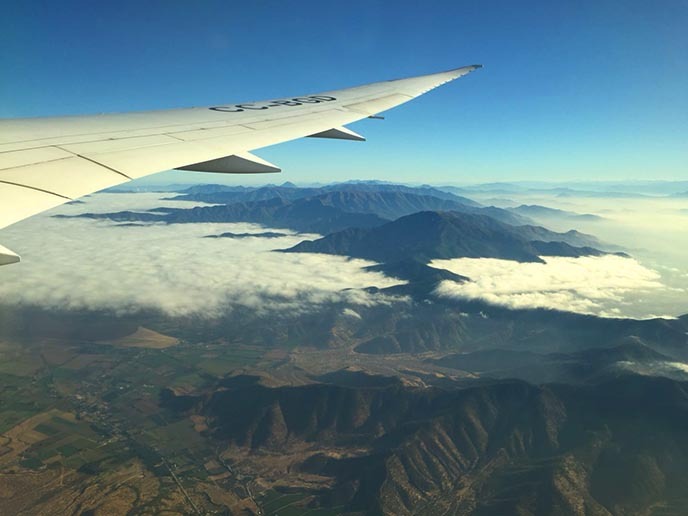 Their flights were comfortable and on-time, with fantastic service from the staff. 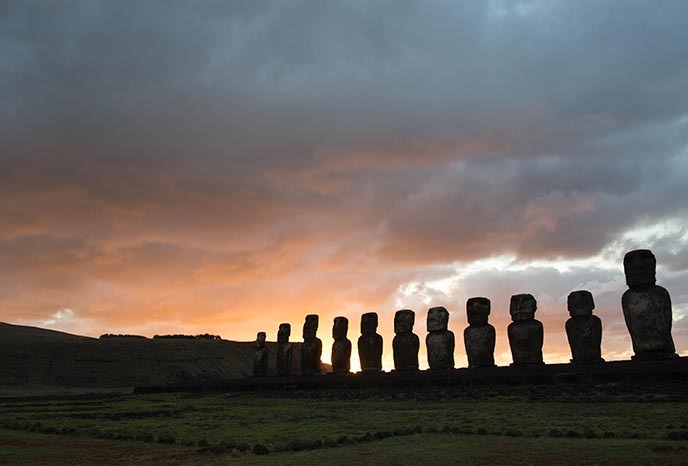 If you’re inspired to come to Easter Island, LATAM is the way to go. I recommend booking a window seat so that you can take in these soaring views. 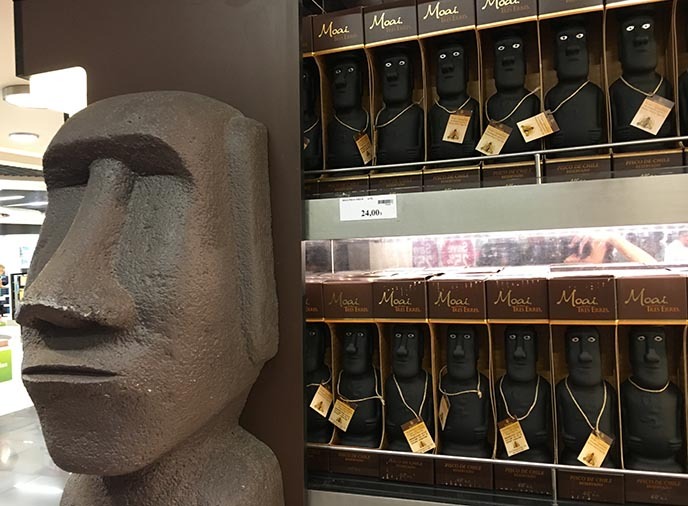 And if you are looking for souvenirs, there are stalls at the little airport with moai-themed goods. Visiting Easter Island felt like I had left the planet, and entered another world. If you’re fascinated by ancient cultures and mysteries, I encourage you to make this trip of a lifetime. 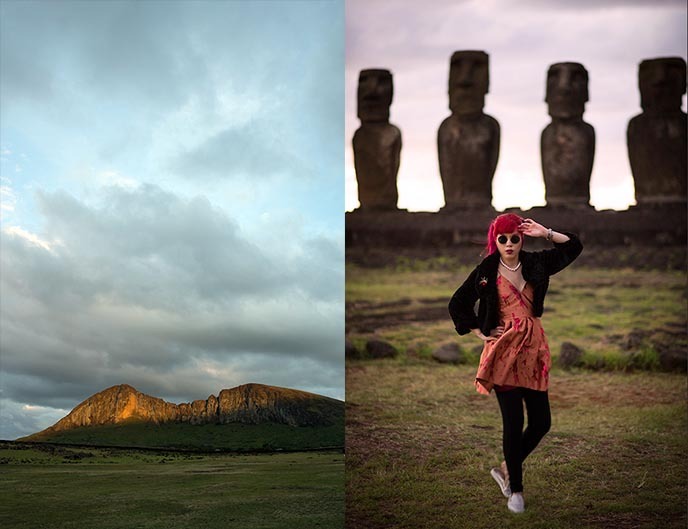 Click to see a short Instagram video of my Easter Island travels. 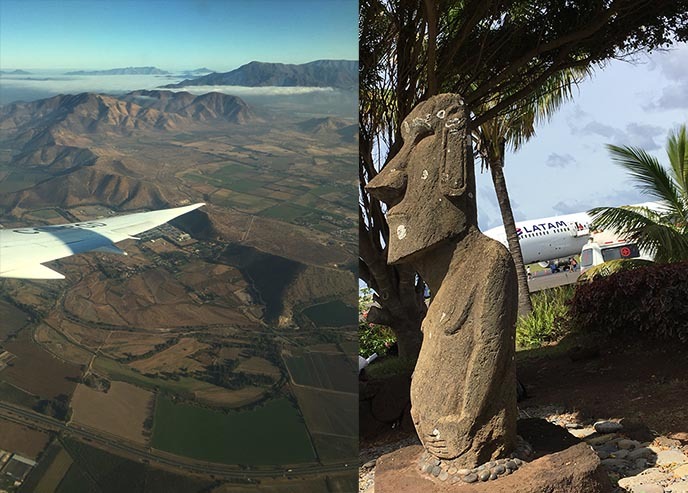 After seeing the stone-faced moai, I think the only thing that can top this… is a journey to outer space! 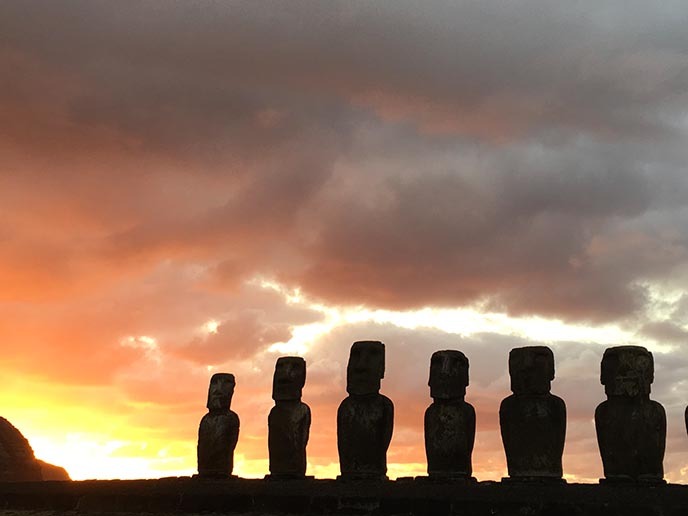 For more travel tips (including our hotel and Day 1 of our tour), see all my Easter Island articles and photos here. Announcement: I’m heading to Japan for travel TV shoot, where I’ll be hosting and producing! I will also be traveling in Thailand and Laos with my pirates. Since this major television program is occupying my full time, I won’t be able to do any blog updates for the next month or so. However I will update my social media regularly with Asia adventures. 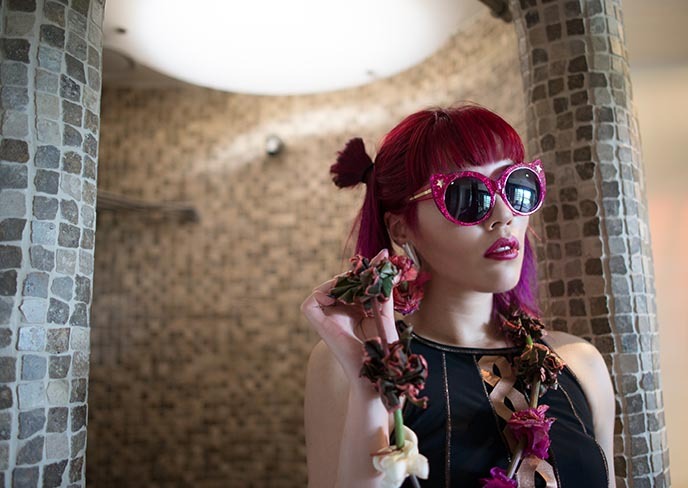 Please feel free to add me on @lacarmina Instagram, Twitter and Facebook for the latest updates! Hanging out at Hangaroa Eco Village & Spa! 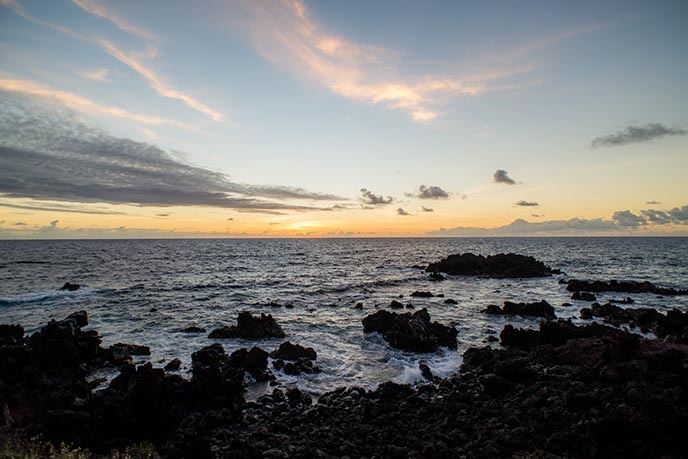 Easter Island luxury hotels & resorts review, Rapa Nui. 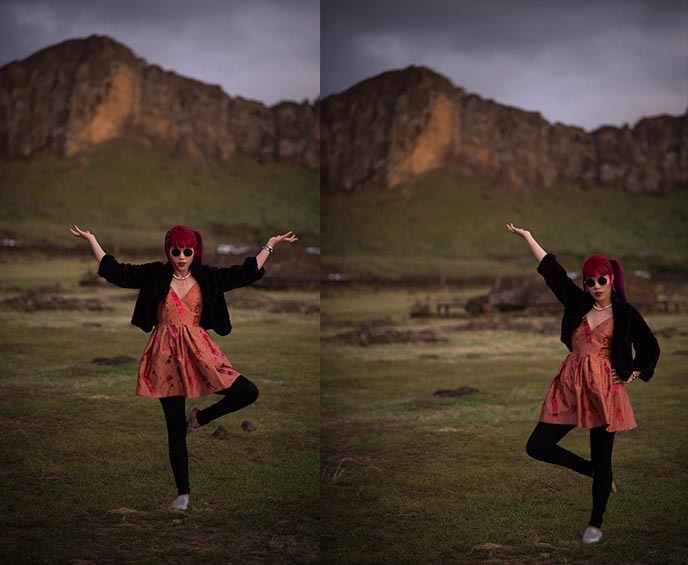 I haven’t yet made it to outer space… but Easter Island is as close as it gets to visiting an alien land! 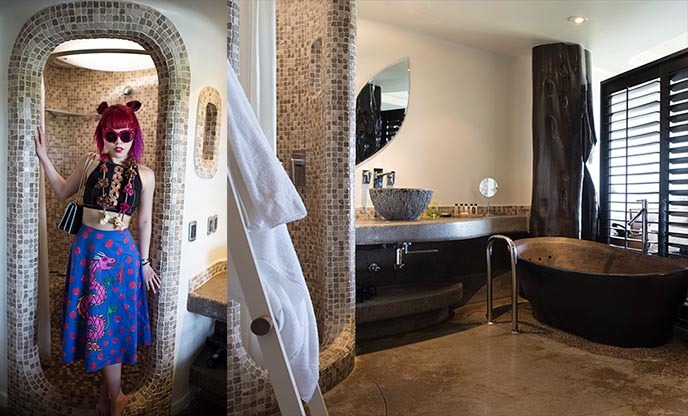 I wanted to stay in a hotel that captured this interplanetary feeling, so I checked into Hangaroa Eco Village & Spa. 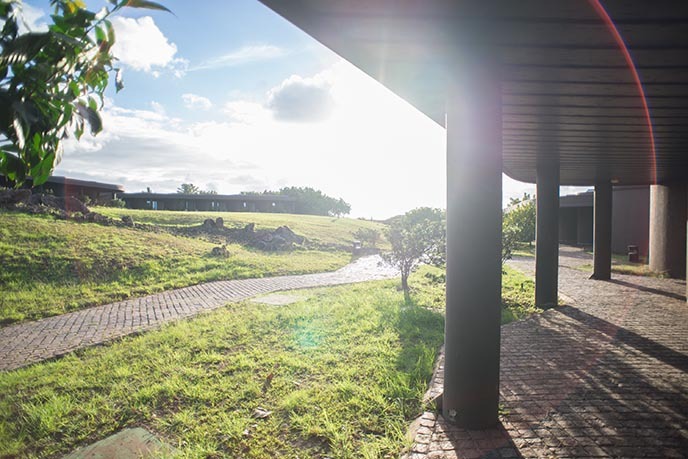 If you’re looking for luxurious, culture-inspired lodging in the isle of the moai , then this is the place for you. To my delight, even the rooms looked like spaceship pods! OOTD: Dragon skirt by Print All Over Me, designed by gentlethrills. My Gottex halter bikini is from UK Swimwear. While you don’t quite need a spaceship to arrive at Easter Island, this isn’t an easy destination to access. 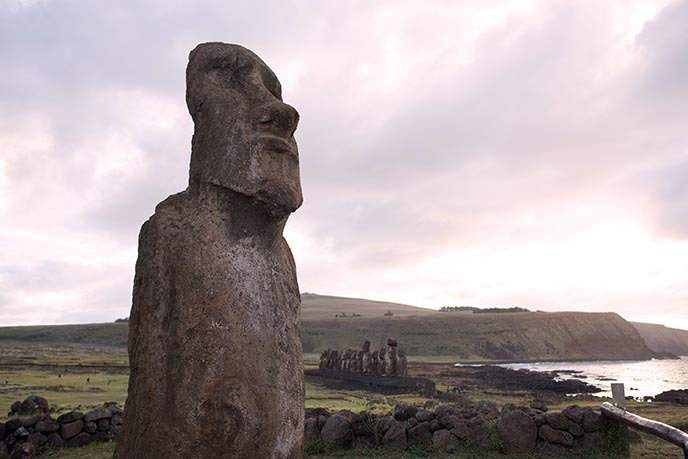 “Isla de Pascua” is located 2300 miles from Chile, in the middle of the ocean and surrounded by nothing. After a smooth flight, we landed at Mataveri International Airport. It’s one of the smallest airports I’ve ever been to — the runway spans the entire vertical distance of the island. As soon as we stepped outside, we felt the hot weather of the South Pacific. I’m glad I brought sunscreen in my carry-on backpack (this is one of the best sunscreens, with UVA protection). 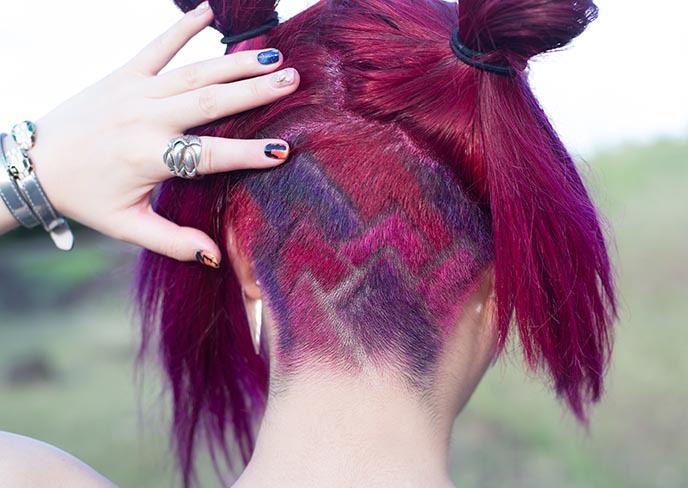 My dyed and patterned undercut also helped me keep me from overheating. My hair color, style and buzzcut are by Chad Mitchell Evans at Kore Salon Vancouver. Claw ring and earrings by Alex Streeter Jewelry. 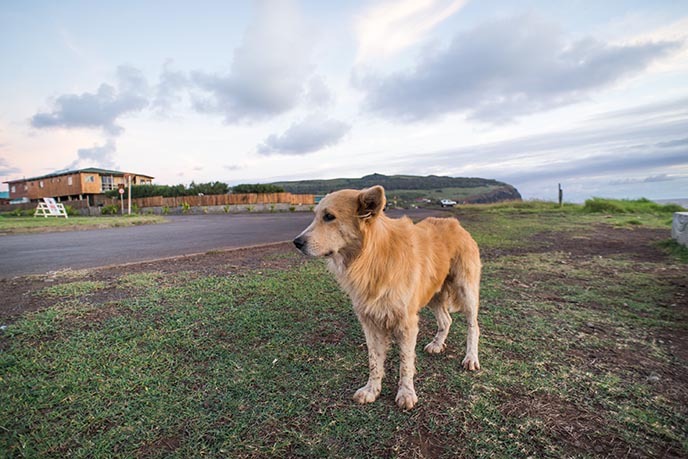 Disembarking is easy at Isla de Pascua airport… there’s only one counter and line. 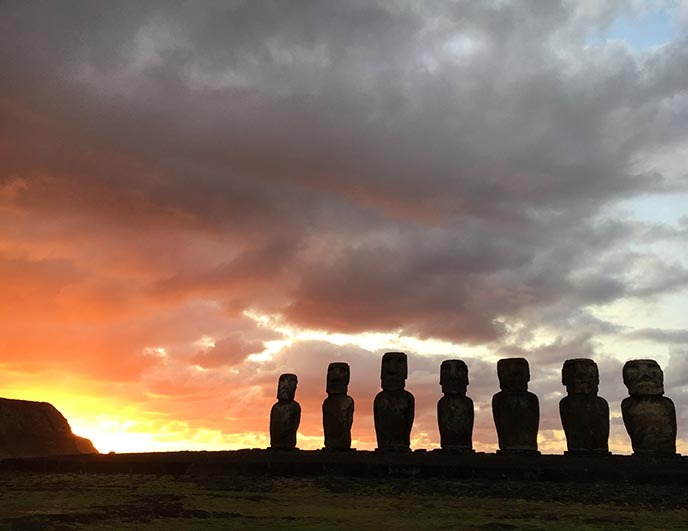 Be sure to purchase the $80 US National Park Ticket, or else you won’t be able to see the most impressive moai sites including Tongariki and Rano Raraku. You can purchase the park pass in USD or Chilean pesos (tip: check the current exchange rate to see which is cheaper). Outside the airport, you’ll find staff members from various hotels and tour groups. We found the sign for Hangaroa Eco Village, and received a lei of flowers to wear around our necks, as well as a hearty “maeva!” (welcome!). 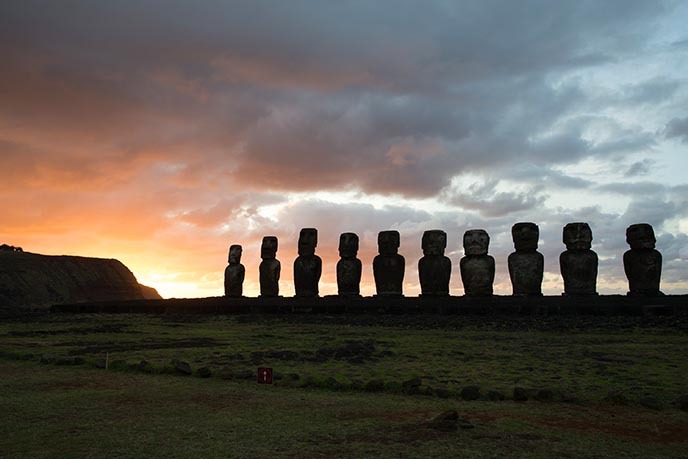 Easter Island is about the size of Manhattan, and our hotel is in the main city of Hanga Roa. It took only a 10-15 minute drive to reach these space-pods. I was happy to kick back in one of best resorts in South America, according to Conde Nast Traveller. The swimming pool beckoned, so I put on my Gottex Profile Sport DNA Bikini by UK Swimwear. I love the halter design, and rose gold on black accents. If you’re looking for the latest swimsuits and beachwear, there’s a fabulous selection on their website. 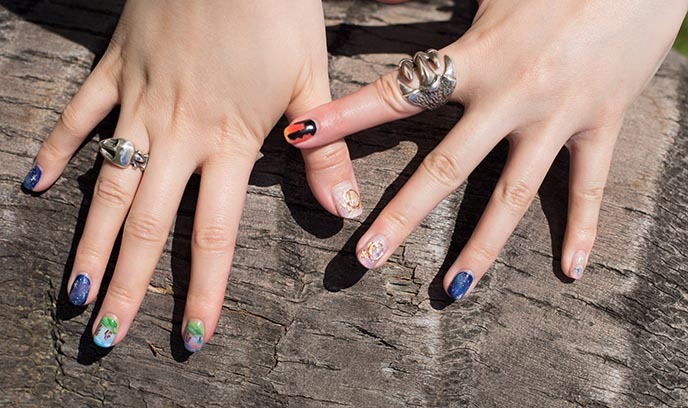 Accessorizing with Easter Island nail art by Glam Nail Studio (close-ups further down), and silver critter rings by Alex Streeter. Time to take a stroll around the hotel grounds. 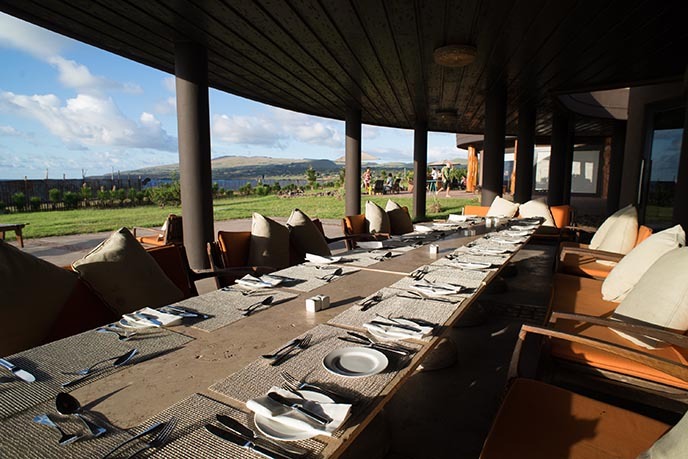 Established in 2012, Hangaroa Eco Village & Spa has the most luxurious accommodations on Easter Island. This five star resort features all-inclusive dining and one-per-day excursion packages, which take the stress out of planning. 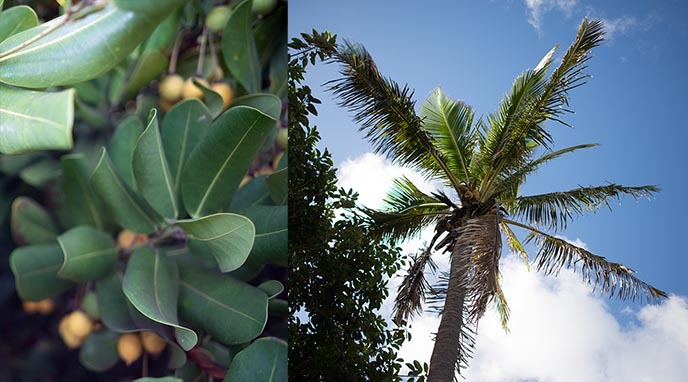 The property is bursting with strange fruits and tall palms. From this convenient location, you can easily explore all the major sights on the island. 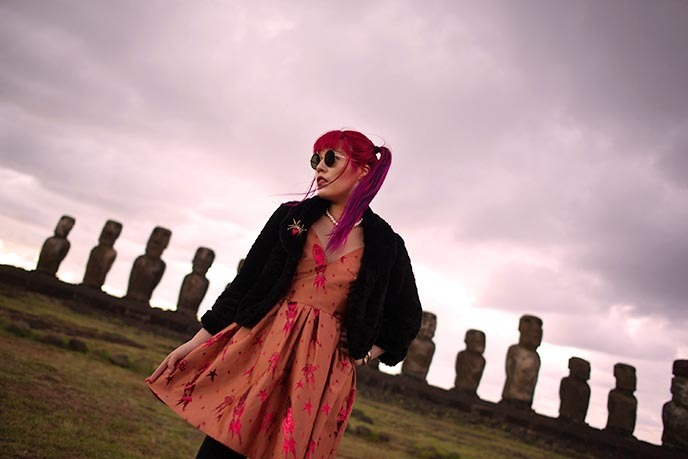 (See my first post about my Easter Island moai tour). Hangaroa Eco Resort’s architecture pays tribute to the village of Orongo (which I visited, as you can see here). The competitors of the birdman competition, Tangata Manu, lived in similar stone huts cut into the hillside. 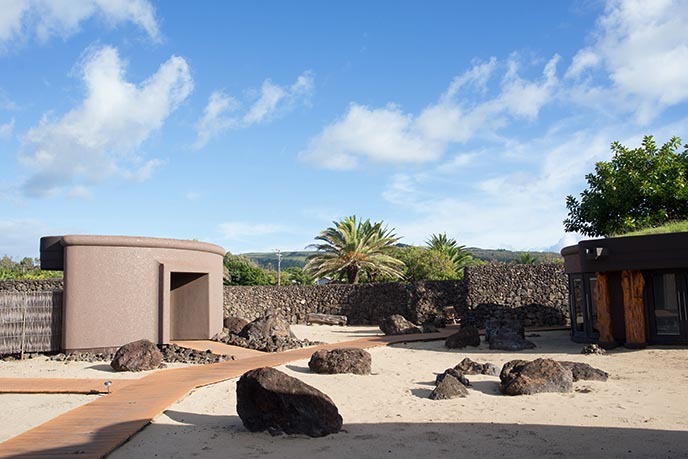 The modern rooms let guests immerse themselves in the ancient Rapa Nui lifestyle. 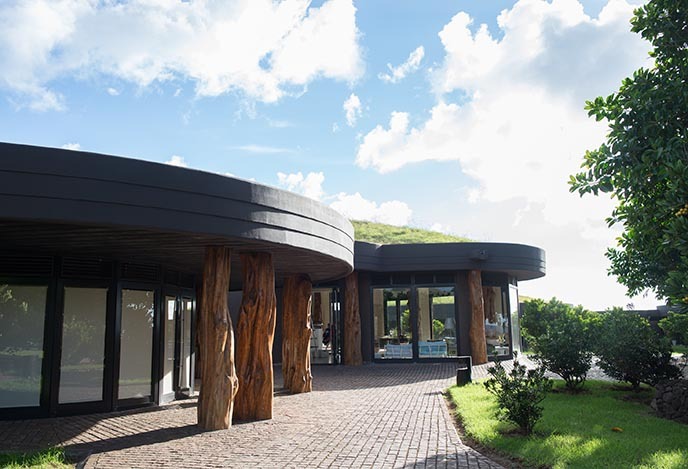 The design is inspired by traditional caves, with curving lines and organic materials including cypress wood and volcanic rock. I enjoyed soaking in the hand-made clay tub each day, and relaxing by the patio with an ocean view. Love how this 75-room resort is integrated to its environment. 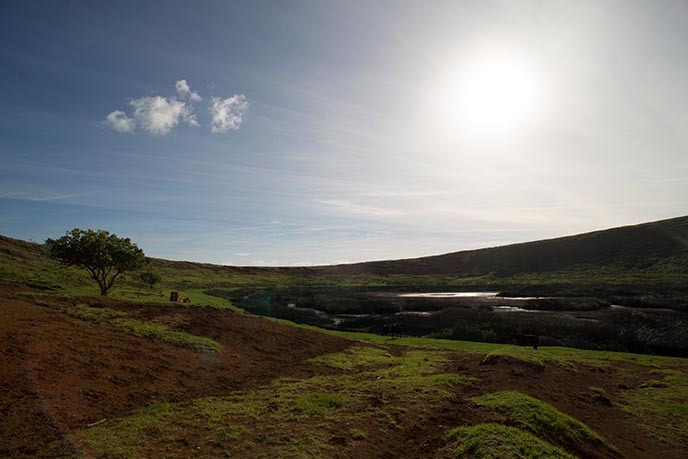 Staying here, you feel as if you’re part of the culture and landscape of Easter Island. Since I was in the land of the stone-faces, I got Easter Island gel nail art to match! Keiko Matsui, the brilliant nail artist and owner at Glam Nail Studio in Vancouver, drew these moai by hand with a tiny brush. 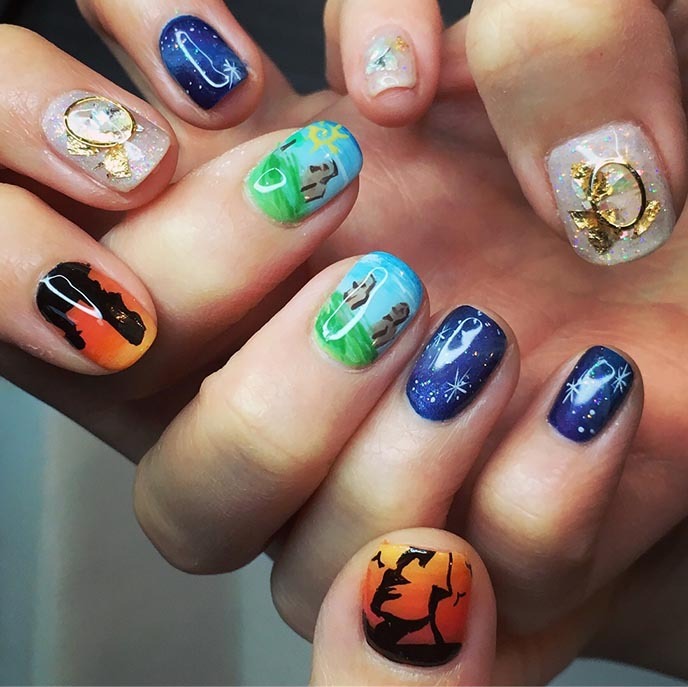 She added sunset and galaxy backgrounds (since Easter Island may as well be in another dimension), gold and iridescent flakes, and metal oval rings. Although most people come to Easter Island to see the moai, this is also a wonderful tropical destination for relaxing in warm weather. Guests can unwind at Hanga Roa Eco Village’s swimming pool and Manavai Spa, after a day of exploration. Wearing a psychedelic gentlethrills skirt from Print All Over Me, and Goth bikini by Gottex from UK Swimwear. 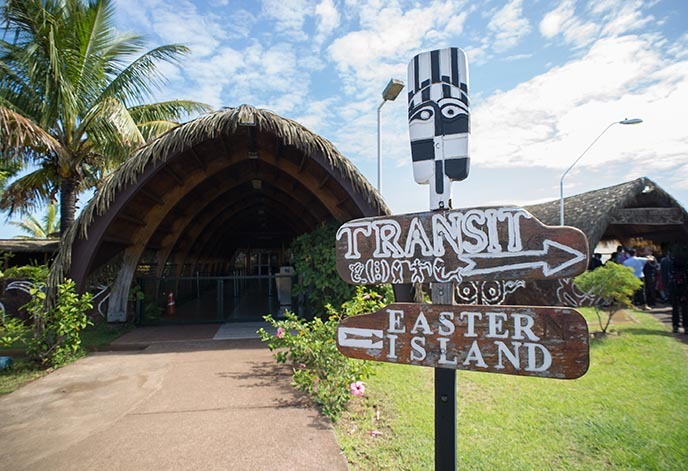 Since Easter Island is basically in the middle of nowhere, it can be difficult to import foods, and restaurants tend to be expensive. 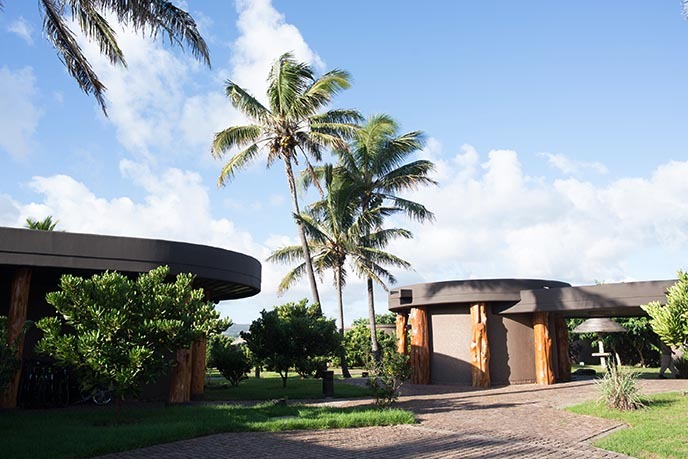 Fortunately, Hangoroa Eco Village & Spa has several excellent dining options that can be included in the booking. How fantastic is this ocean and mountain view? 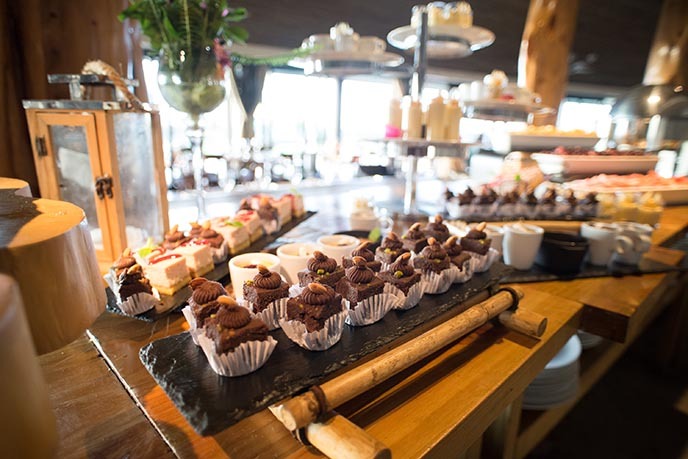 The open-air Poerava Restaurant offers a gourmet buffet at breakfast and dinner, with a wide selection of intercontinental and local specialties. We filled up on grilled fish, creamy grits, roast vegetables, ceviche… and tried one of each dessert! 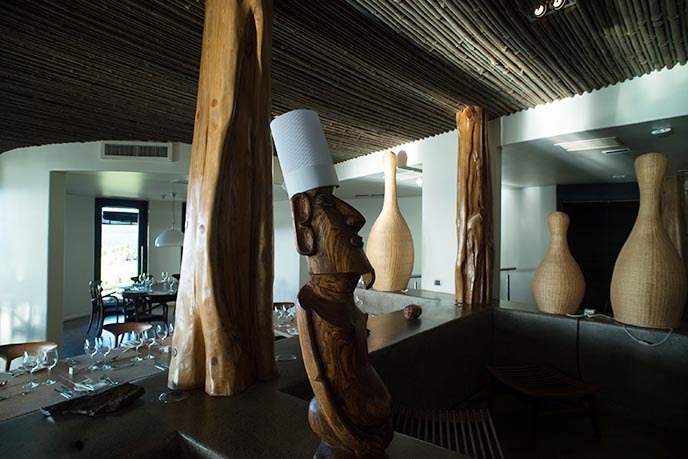 How cute is this moai, wearing a chef’s hat? On another evening, we ate at the resort’s Kaloa Bistro, where you can order South American dishes a-la-carte. Can’t go wrong with fresh empanadas, Chilean red wine and steak. 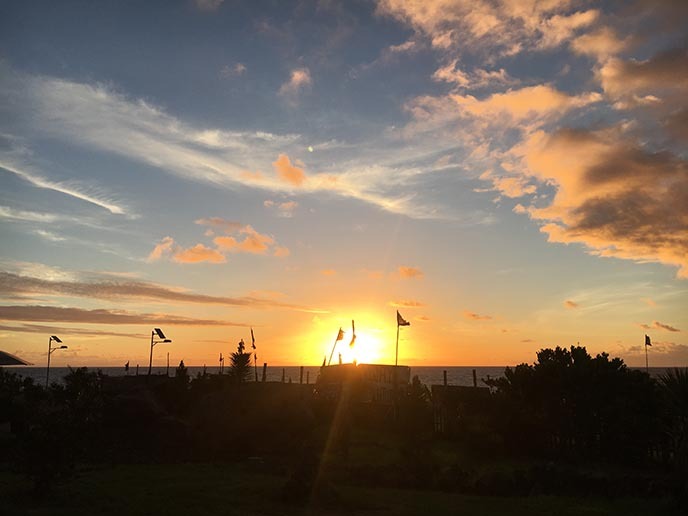 Every evening, Hangaroa Eco Village brings together guests for a free sunset cocktail at Vaikoa Bar. The special drink that evening was a pisco sour (lemon, Chilean clear brandy, egg white, bitters). I was delighted by the design of the liqueur bottle: it’s shaped like a moai with a “pukao” hat as the screw-on cap! 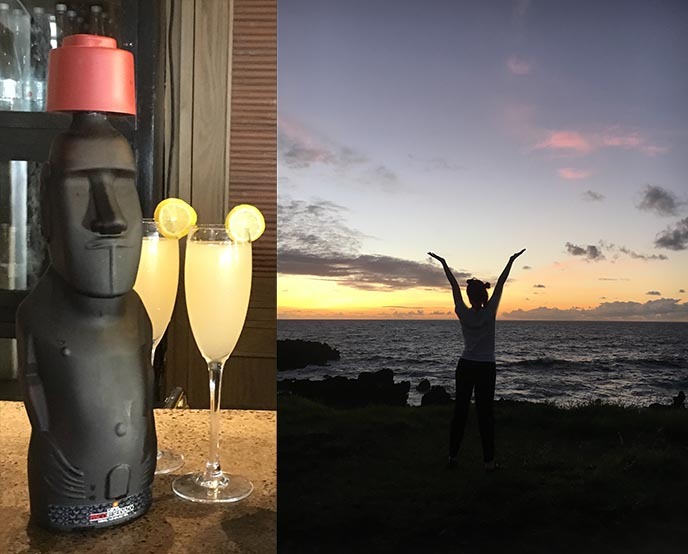 This is my happy place… sipping a moai pisco sour, and taking in the radiant sunset over the volcanic rocks and ocean. … and chatted with other travellers. Everyone expressed their amazement at being on this far-away island filled with mysteries. 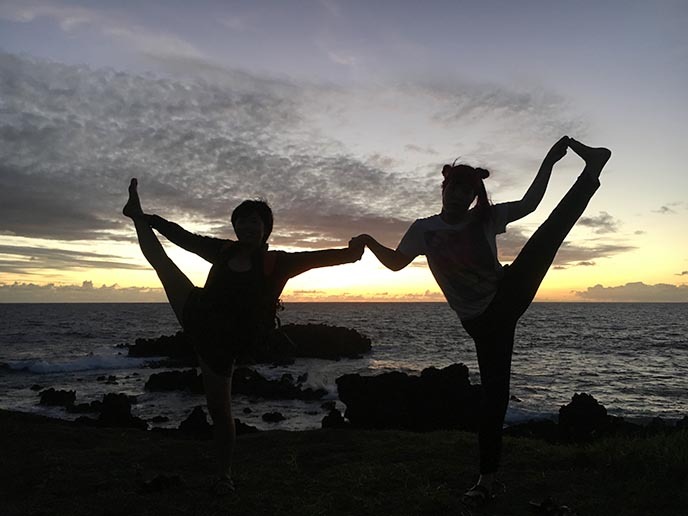 The sunset silhouettes called for an “utthita hasta padangusthasana” yoga pose (extended hand-to-big-toe asana). 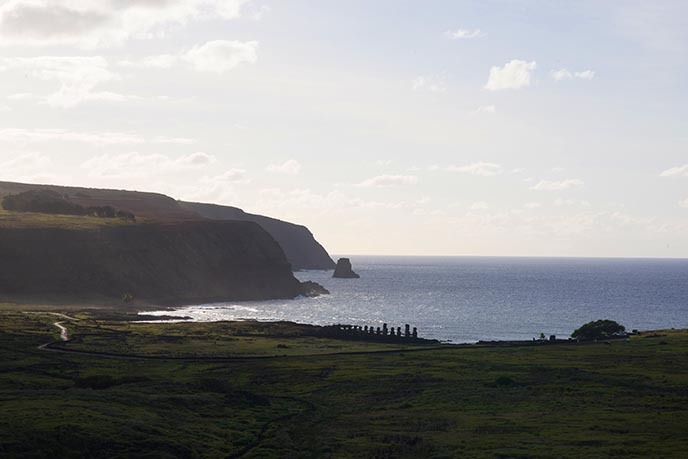 Easter Island is truly unlike anywhere else on the planet. Now, I think the only thing that can top this experience is a trip to space. 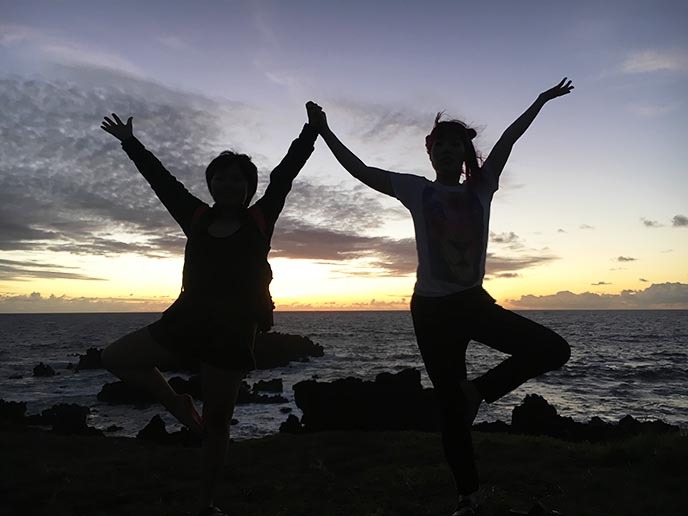 A tree-pose and namaste to Hangaroa Eco Village & Spa, for a stay filled with warm memories. 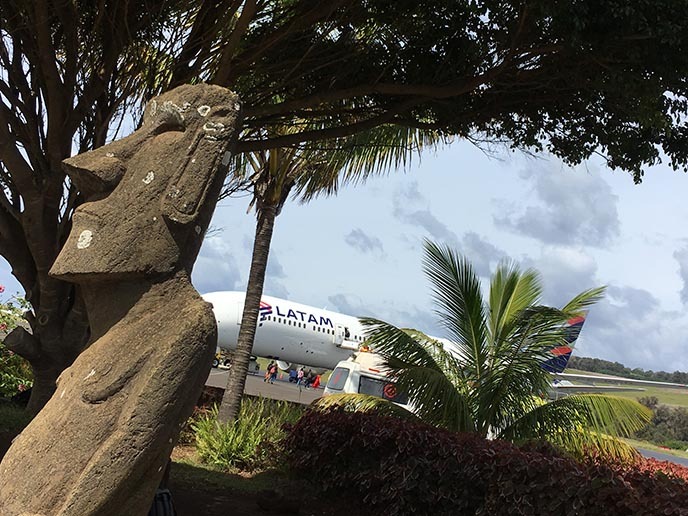 And a big thank you to LATAM Airlines for making this long-awaited trip possible. 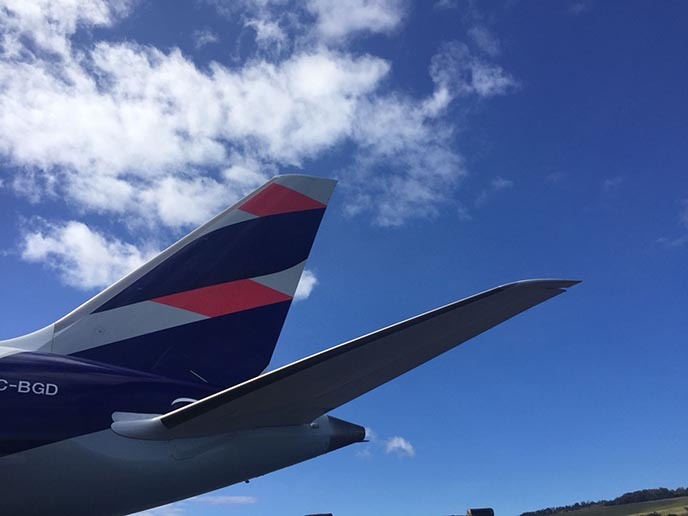 You can book a roundtrip to Rapa Nui with them, flying from either Bora Bora or Santiago. Aren’t the stone-faced statues fabulous? 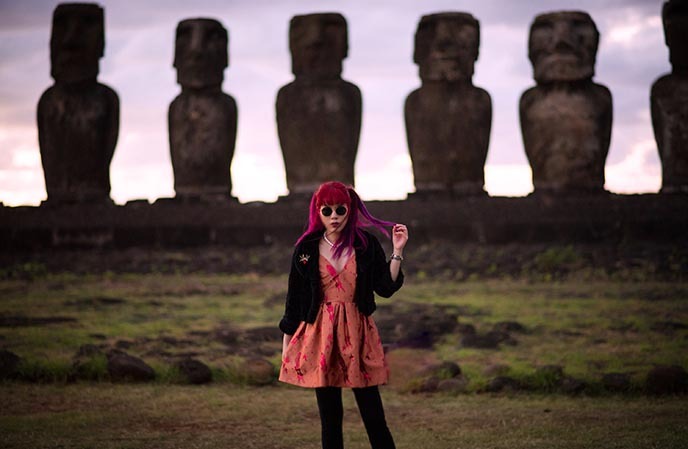 For more about them, see my Easter Island moai photos here. I never buy travel souvenirs, as I’m a minimalist… but I couldn’t resist getting some t-shirts and mini moais. This is a once-in-a-lifetime trip, after all. I was tempted to take home the giant head… but I settled for a bottle of pisco alcohol, in the shape of a googly-eyed moai. 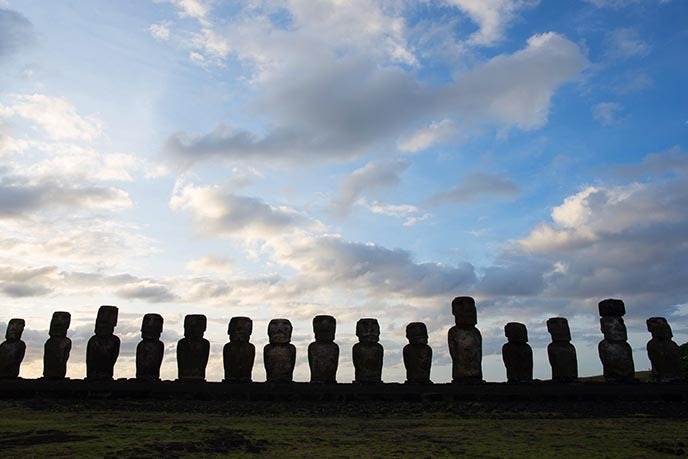  Isn’t Easter Island a fascinating destination? There’s still one more story to come, from two of the most famous UNESCO sites here… stay tuned.